Description: On a train headed for hanging sits Butch Cavendish, the worst outlaw in recent memory. On the same train sits the newly appointed district attorney John Reid, and he's about to get very much in over his head. I don't think most people from my generation really know who The Lone Ranger is. 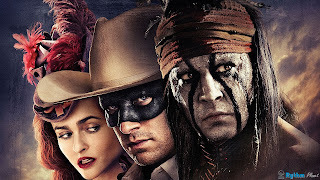 This is why I kind of doubt the validity of making a Lone Ranger movie so long after the original serials run. It's also strange considering that The Green Hornet already had his modern movie years ago. But I guess that's how it is. Movie companies are willing to revive almost any franchise these days on the slim chance that it will make them a quick buck. This movie is very much a product of the times we live in. Now, more than ever, Hollywood pumps out adaptations of every character that even smells of superhero. It's a money-making movie, but that doesn't mean it's bad. No actually, while the movie may ride on the success of both Pirates of the Carribean (the connection to that movie series being mentioned in all promotional material) and the current success of the superhero movie genre - I really found myself enjoying it. Indeed, the connection to the Pirates movie series is not actually that far fetched, beyond the casting choice of Johnny Depp I mean. The movie plays very much the same nature as the first Pirates movie, Armie Hammer being the wide-eyed, by-the-books innocent hero to bounce off of Johnny Depp's very energetic broken hero. It is very much the same character dynamic as that of Orlando Blooms chemistry as Will Turner with Depp's insanely popular Jack Sparrow. What it seems to me they tried to do, was make a repeat performance of what Pirates did. In essence, take a genre that has seen a decline and try to put it back in the minds of the children. It is very much a high adventure movie that seems to focus on catching the attention of kids. I'm not saying it's a bad business plan, I just think the timing is a little weird. Opening the movie the same weekend as the sequel to an already popular franchise (in this case, Despicable Me 2) is never all that good of an idea. get all that much screen time in this movie. So to those of you that don't know (and I expect a lot of you) The Lone Ranger was a radio-play turned cinematic series in the 40's and 50's. It followed the adventures of a masked cowboy riding with his partner and mentor Tonto to be vigilantes in the old west. Most of the clichés you think of when you think of the cowboy genre originated in this series. Right down to the use of a sped-up version of the Wilhelm Tell Overture, today a piece of music very much associated with westerns right along the theme to The Good, The Bad and The Ugly. The Lone Ranger was very much a part of the reason kids played cowboys and Indians back in the day. 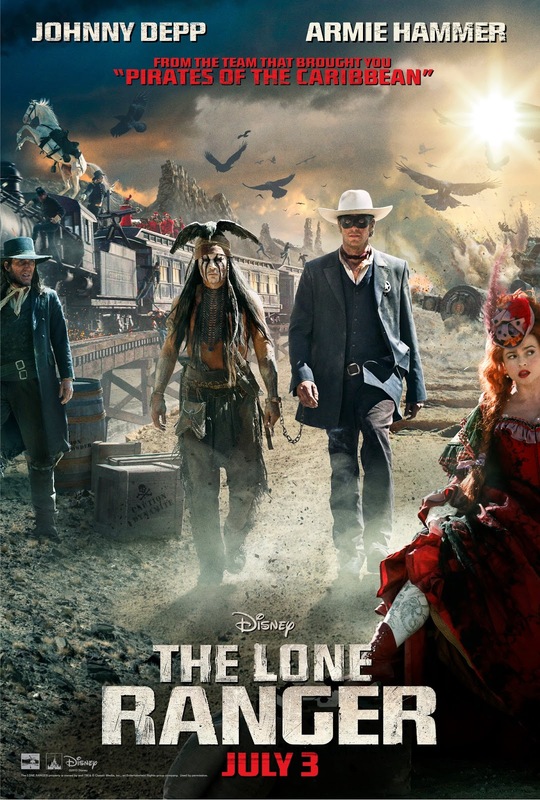 As such the movie actually manages to capture the spirit of The Lone Ranger very well. Intentionally or not, it is also very much full of elements from the Lucky Luke comic book series. That being the type of humor used. If you're still not so hot on the concept of a Lone Ranger adaptation, you can think of it as a Lucky Luke adaptation instead. The movie has a lot of the elements you would combine with the western genre, chases, train robberies, the cavalry fighting native Americans, they even put in an old fashioned whorehouse. The plot is what you would expect from a PG-rated western. It encompasses the newly built railroad, the relationship between native Americans and the newly formed U.S. government, the dog-eat-dog world that the romanticized west has and a bit of weird spirituality thrown in to give the movie a mystical element.I'm actually quite impressed with how accurately the movie recaptured the spirit of that particular genre while still staying somewhat fresh. It most definitely uses CGI unnecessarily at some points but at the same time the special effects are mostly used for comedy so it's kind of forgivable. No Hollywood, CGI rabbits will never look good. Is this movie anything special? No, it most definitely isn't. It's kind of forgettable in how "okay" it is. But as a summer blockbuster it does it job. If you happen to go to the cinema to waste an evening or afternoon, this is worth the price-point of entrance. But nothing more. If you don't have the cash to go see it in theaters, consider tracking it down after a price-drop. It's serviceable enough and a lot of fun while you actually sit in the theater. And I'm okay with that, sometimes you don't need any more.